The United States subprime mortgage crisis was a nationwide financial crisis, occurring between 2007 and 2010, that contributed to the U.S. recession of December 2007 – June 2009. It was triggered by a large decline in home prices after the collapse of a housing bubble, leading to mortgage delinquencies and foreclosures and the devaluation of housing-related securities. Declines in residential investment preceded the recession and were followed by reductions in household spending and then business investment. Spending reductions were more significant in areas with a combination of high household debt and larger housing price declines. The housing bubble that preceded the crisis was financed with mortgage-backed securities (MBSes) and collateralized debt obligations (CDOs), which initially offered higher interest rates (i.e. better returns) than government securities, along with attractive risk ratings from rating agencies. While elements of the crisis first became more visible during 2007, several major financial institutions collapsed in September 2008, with significant disruption in the flow of credit to businesses and consumers and the onset of a severe global recession. There were many causes of the crisis, with commentators assigning different levels of blame to financial institutions, regulators, credit agencies, government housing policies, and consumers, among others. Two proximate causes were the rise in subprime lending and the increase in housing speculation. The percentage of lower-quality subprime mortgagesoriginated during a given year rose from the historical 8% or lower range to approximately 20% from 2004 to 2006, with much higher ratios in some parts of the U.S. A high percentage of these subprime mortgages, over 90% in 2006 for example, were adjustable-rate mortgages. Housing speculation also increased, with the share of mortgage originations to investors (i.e. those owning homes other than primary residences) rising significantly from around 20% in 2000 to around 35% in 2006–2007. Investors, even those with prime credit ratings, were much more likely to default than non-investors when prices fell. These changes were part of a broader trend of lowered lending standards and higher-risk mortgage products, which contributed to U.S. households becoming increasingly indebted. The ratio of household debt to disposable personal income rose from 77% in 1990 to 127% by the end of 2007. When U.S. home prices declined steeply after peaking in mid-2006, it became more difficult for borrowers to refinance their loans. As adjustable-rate mortgages began to reset at higher interest rates (causing higher monthly payments), mortgage delinquencies soared. Securities backed with mortgages, including subprime mortgages, widely held by financial firms globally, lost most of their value. Global investors also drastically reduced purchases of mortgage-backed debt and other securities as part of a decline in the capacity and willingness of the private financial system to support lending. Concerns about the soundness of U.S. credit and financial markets led to tightening credit around the world and slowing economic growth in the U.S. and Europe. The crisis had severe, long-lasting consequences for the U.S. and European economies. The U.S. entered a deep recession, with nearly 9 million jobs lost during 2008 and 2009, roughly 6% of the workforce. The number of jobs did not return to the December 2007 pre-crisis peak until May 2014. 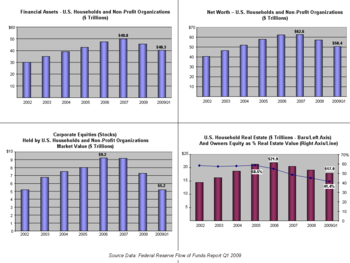 U.S. household net worth declined by nearly $13 trillion (20%) from its Q2 2007 pre-crisis peak, recovering by Q4 2012. U.S. housing prices fell nearly 30% on average and the U.S. stock market fell approximately 50% by early 2009, with stocks regaining their December 2007 level during September 2012. One estimate of lost output and income from the crisis comes to “at least 40% of 2007 gross domestic product“. Europe also continued to struggle with its own economic crisis, with elevated unemployment and severe banking impairments estimated at €940 billion between 2008 and 2012. As of January 2018, U.S. bailout funds had been fully recovered by the government, when interest on loans is taken into consideration. A total of $626B was invested, loaned, or granted due to various bailout measures, while $390B had been returned to the Treasury. The Treasury had earned another $323B in interest on bailout loans, resulting in an $87B profit. The immediate cause or trigger of the crisis was the bursting of the United States housing bubble which peaked in approximately 2005–2006. An increase in loan incentives such as easy initial terms and a long-term trend of rising housing prices had encouraged borrowers to assume risky mortgages in the anticipation that they would be able to quickly refinance at easier terms. However, once interest rates began to rise and housing prices started to drop moderately in 2006–2007 in many parts of the U.S., borrowers were unable to refinance. Defaults and foreclosureactivity increased dramatically as easy initial terms expired, home prices fell, and adjustable-rate mortgage (ARM) interest rates reset higher. As housing prices fell, global investor demand for mortgage-related securities evaporated. This became apparent by July 2007, when investment bank Bear Stearns announced that two of its hedge funds had imploded. These funds had invested in securities that derived their value from mortgages. When the value of these securities dropped, investors demanded that these hedge funds provide additional collateral. This created a cascade of selling in these securities, which lowered their value further. Economist Mark Zandi wrote that this 2007 event was “arguably the proximate catalyst” for the financial market disruption that followed. Several other factors set the stage for the rise and fall of housing prices, and related securities widely held by financial firms. In the years leading up to the crisis, the U.S. received large amounts of foreign money from fast-growing economies in Asia and oil-producing/exporting countries. This inflow of funds combined with low U.S. interest rates from 2002 to 2004 contributed to easy credit conditions, which fueled both housing and credit bubbles. Loans of various types (e.g., mortgage, credit card, and auto) were easy to obtain and consumers assumed an unprecedented debt load. As part of the housing and credit booms, the number of financial agreements called mortgage-backed securities (MBS), which derive their value from mortgage payments and housing prices, greatly increased. Such financial innovation enabled institutions and investors around the world to invest in the U.S. housing market. As housing prices declined, major global financial institutions that had borrowed and invested heavily in MBS reported significant losses. Defaults and losses on other loan types also increased significantly as the crisis expanded from the housing market to other parts of the economy. Total losses were estimated in the trillions of U.S. dollars globally. While the housing and credit bubbles were growing, a series of factors caused the financial system to become increasingly fragile. Policymakers did not recognize the increasingly important role played by financial institutions such as investment banks and hedge funds, also known as the shadow banking system. These entities were not subject to the same regulations as depository banking. Further, shadow banks were able to mask the extent of their risk taking from investors and regulators through the use of complex, off-balance sheet derivatives and securitizations. Economist Gary Gorton has referred to the 2007–2008 aspects of the crisis as a “run” on the shadow banking system. The complexity of these off-balance sheet arrangements and the securities held, as well as the interconnection between larger financial institutions, made it virtually impossible to re-organize them via bankruptcy, which contributed to the need for government bailouts. Some experts believe these shadow institutions had become as important as commercial (depository) banks in providing credit to the U.S. economy, but they were not subject to the same regulations. These institutions as well as certain regulated banks had also assumed significant debt burdens while providing the loans described above and did not have a financial cushion sufficient to absorb large loan defaults or MBS losses. The losses experienced by financial institutions on their mortgage-related securities impacted their ability to lend, slowing economic activity. Interbank lending dried-up initially and then loans to non-financial firms were affected. Concerns regarding the stability of key financial institutions drove central banks to take action to provide funds to encourage lending and to restore faith in the commercial paper markets, which are integral to funding business operations. Governments also bailed out key financial institutions, assuming significant additional financial commitments. The risks to the broader economy created by the housing market downturn and subsequent financial market crisis were primary factors in several decisions by central banks around the world to cut interest rates and governments to implement economic stimulus packages. Effects on global stock markets due to the crisis were dramatic. Between 1 January and 11 October 2008, owners of stocks in U.S. corporations suffered about $8 trillion in losses, as their holdings declined in value from $20 trillion to $12 trillion. Losses in other countries averaged about 40%. Losses in the stock markets and housing value declines place further downward pressure on consumer spending, a key economic engine. Leaders of the larger developed and emerging nations met in November 2008 and March 2009 to formulate strategies for addressing the crisis. A variety of solutions have been proposed by government officials, central bankers, economists, and business executives. In the U.S., the Dodd–Frank Wall Street Reform and Consumer Protection Act was signed into law in July 2010 to address some of the causes of the crisis. The crisis can be attributed to several factors, which emerged over a number of years. Causes proposed include the inability of homeowners to make their mortgage payments (due primarily to adjustable-rate mortgages resetting, borrowers overextending, predatory lending, and speculation), overbuilding during the boom period, risky mortgage products, increased power of mortgage originators, high personal and corporate debt levels, financial products that distributed and perhaps concealed the risk of mortgage default, monetary and housing policies that encouraged risk-taking and more debt, international trade imbalances, and inappropriate government regulation. Excessive consumer housing debt was in turn caused by the mortgage-backed security, credit default swap, and collateralized debt obligation sub-sectors of the finance industry, which were offering irrationally low interest rates and irrationally high levels of approval to subprime mortgageconsumers due in part to faulty financial models. Debt consumers were acting in their rational self-interest, because they were unable to audit the finance industry’s opaque faulty risk pricing methodology. Among the important catalysts of the subprime crisis were the influx of money from the private sector, the banks entering into the mortgage bond market, government policies aimed at expanding homeownership, speculation by many home buyers, and the predatory lending practices of the mortgage lenders, specifically the adjustable-rate mortgage, 2–28 loan, that mortgage lenders sold directly or indirectly via mortgage brokers. On Wall Street and in the financial industry, moral hazard lay at the core of many of the causes. Federal Reserve Chair Ben Bernanke testified in September 2010 regarding the causes of the crisis. He wrote that there were shocks or triggers (i.e., particular events that touched off the crisis) and vulnerabilities (i.e., structural weaknesses in the financial system, regulation and supervision) that amplified the shocks. Examples of triggers included: losses on subprime mortgage securities that began in 2007 and a run on the shadow banking system that began in mid-2007, which adversely affected the functioning of money markets. Examples of vulnerabilities in the private sector included: financial institution dependence on unstable sources of short-term funding such as repurchase agreements or Repos; deficiencies in corporate risk management; excessive use of leverage (borrowing to invest); and inappropriate usage of derivatives as a tool for taking excessive risks. Examples of vulnerabilities in the public sector included: statutory gaps and conflicts between regulators; ineffective use of regulatory authority; and ineffective crisis management capabilities. Bernanke also discussed “Too big to fail” institutions, monetary policy, and trade deficits. During May 2010, Warren Buffett and Paul Volcker separately described questionable assumptions or judgments underlying the U.S. financial and economic system that contributed to the crisis. These assumptions included: 1) Housing prices would not fall dramatically; 2) Free and open financial markets supported by sophisticated financial engineering would most effectively support market efficiency and stability, directing funds to the most profitable and productive uses; 3) Concepts embedded in mathematics and physics could be directly adapted to markets, in the form of various financial models used to evaluate credit risk; 4) Economic imbalances, such as large trade deficits and low savings rates indicative of over-consumption, were sustainable; and 5) Stronger regulation of the shadow banking system and derivatives markets was not needed. Economists surveyed by the University of Chicago during 2017 rated the factors that caused the crisis in order of importance: 1) Flawed financial sector regulation and supervision; 2) Underestimating risks in financial engineering (e.g., CDOs); 3) Mortgage fraud and bad incentives; 4) Short-term funding decisions and corresponding runs in those markets (e.g., repo); and 5) Credit rating agency failures. There was the equivalent of a bank run on the shadow banking system, which includes investment banks and other non-depository financial entities. This system had grown to rival the depository system in scale yet was not subject to the same regulatory safeguards. The economy was being driven by a housing bubble. When it burst, private residential investment (i.e., housing construction) fell by nearly 4% GDP and consumption enabled by bubble-generated housing wealth also slowed. This created a gap in annual demand (GDP) of nearly $1 trillion. Government was unwilling to make up for this private sector shortfall. Housing speculation using high levels of mortgage debt drove many investors with prime-quality mortgages (i.e., those investors in the middle of the credit score distribution) to default and enter foreclosure on investment properties when housing prices fell; the blame on “subprime” homeowners (i.e., those at the bottom of the credit score distribution) was overstated. Government policies that encouraged home ownership even for those who could not afford it, contributing to lax lending standards, unsustainable housing price increases, and indebtedness. 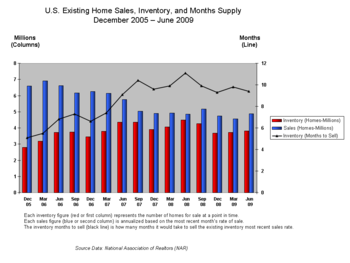 Existing homes sales, inventory, and months supply, by quarter. Vicious cycles in the housing and financial markets. According to Robert J. Shiller and other economists, housing price increases beyond the general inflation rate are not sustainable in the long term. From the end of World War II to the beginning of the housing bubble in 1997, housing prices in the US remained relatively stable. The bubble was characterized by higher rates of household debt and lower savings rates, slightly higher rates of home ownership, and of course higher housing prices. It was fueled by low interest rates and large inflows of foreign funds that created easy credit conditions. 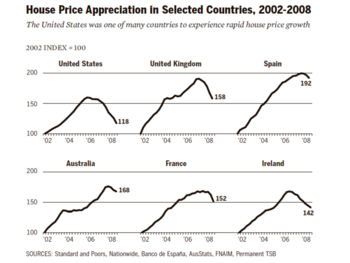 Between 1997 and 2006 (the peak of the housing bubble), the price of the typical American house increased by 124%. From 1980 to 2001, the ratio of median home prices to median household income (a measure of ability to buy a house) fluctuated from 2.9 to 3.1. In 2004 it rose to 4.0, and by 2006 it hit 4.6. The housing bubble was more pronounced in coastal areas where the ability to build new housing was restricted by geography or land use restrictions. This housing bubble resulted in quite a few homeowners refinancing their homes at lower interest rates, or financing consumer spending by taking out second mortgages secured by the price appreciation. 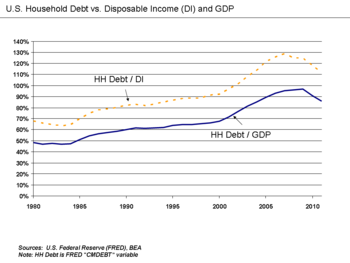 US household debt as a percentage of annual disposable personal income was 127% at the end of 2007, versus 77% in 1990. While housing prices were increasing, consumers were saving less and both borrowing and spending more. 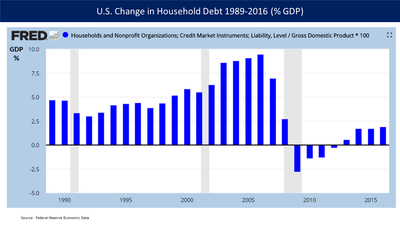 Household debt grew from $705 billion at year end 1974, 60% of disposable personal income, to $7.4 trillion at yearend 2000, and finally to $14.5 trillion in midyear 2008, 134% of disposable personal income.During 2008, the typical US household owned 13 credit cards, with 40% of households carrying a balance, up from 6% in 1970. This credit and house price explosion led to a building boom and eventually to a surplus of unsold homes, which caused U.S. housing prices to peak and begin declining in mid-2006. Easy credit, and a belief that house prices would continue to appreciate, had encouraged many subprime borrowers to obtain adjustable-rate mortgages. These mortgages enticed borrowers with a below market interest rate for some predetermined period, followed by market interest rates for the remainder of the mortgage’s term. The US home ownership rate increased from 64% in 1994 (about where it had been since 1980) to an all-time high of 69.2% in 2004. Subprime lending was a major contributor to this increase in home ownership rates and in the overall demand for housing, which drove prices higher. Borrowers who would not be able to make the higher payments once the initial grace period ended, were planning to refinance their mortgages after a year or two of appreciation. As a result of the depreciating housing prices, borrowers ability to refinance became more difficult. Borrowers who found themselves unable to escape higher monthly payments by refinancing began to default. As more borrowers stopped making their mortgage payments, foreclosures and the supply of homes for sale increased. This placed downward pressure on housing prices, which further lowered homeowners’ equity. The decline in mortgage payments also reduced the value of mortgage-backed securities, which eroded the net worth and financial health of banks. This vicious cycle was at the heart of the crisis. By September 2008, average U.S. housing prices had declined by over 20% from their mid-2006 peak. This major and unexpected decline in house prices means that many borrowers have zero or negative equity in their homes, meaning their homes were worth less than their mortgages. As of March 2008, an estimated 8.8 million borrowers – 10.8% of all homeowners – had negative equity in their homes, a number that is believed to have risen to 12 million by November 2008. By September 2010, 23% of all U.S. homes were worth less than the mortgage loan. Borrowers in this situation have an incentive to default on their mortgages as a mortgage is typically nonrecourse debt secured against the property. Economist Stan Leibowitz argued in the Wall Street Journal that although only 12% of homes had negative equity, they comprised 47% of foreclosures during the second half of 2008. He concluded that the extent of equity in the home was the key factor in foreclosure, rather than the type of loan, credit worthiness of the borrower, or ability to pay. Increasing foreclosure rates increases the inventory of houses offered for sale. The number of new homes sold in 2007 was 26.4% less than in the preceding year. By January 2008, the inventory of unsold new homes was 9.8 times the December 2007 sales volume, the highest value of this ratio since 1981. Furthermore, nearly four million existing homes were for sale, of which roughly 2.2 million were vacant. This overhang of unsold homes lowered house prices. As prices declined, more homeowners were at risk of default or foreclosure. House prices are expected to continue declining until this inventory of unsold homes (an instance of excess supply) declines to normal levels. A report in January 2011 stated that U.S. home values dropped by 26 percent from their peak in June 2006 to November 2010, more than the 25.9% drop between 1928 to 1933 when the Great Depression occurred. From September 2008 to September 2012, there were approximately 4 million completed foreclosures in the U.S. As of September 2012, approximately 1.4 million homes, or 3.3% of all homes with a mortgage, were in some stage of foreclosure compared to 1.5 million, or 3.5%, in September 2011. During September 2012, 57,000 homes completed foreclosure; this is down from 83,000 the prior September but well above the 2000–2006 average of 21,000 completed foreclosures per month. Housing prices nearly doubled between 2000 and 2006, a vastly different trend from the historical appreciation at roughly the rate of inflation. While homes had not traditionally been treated as investments subject to speculation, this behavior changed during the housing boom. Media widely reported condominiums being purchased while under construction, then being “flipped” (sold) for a profit without the seller ever having lived in them.Some mortgage companies identified risks inherent in this activity as early as 2005, after identifying investors assuming highly leveraged positions in multiple properties. One 2017 NBER study argued that real estate investors (i.e., those owning 2+ homes) were more to blame for the crisis than subprime borrowers: “The rise in mortgage defaults during the crisis was concentrated in the middle of the credit score distribution, and mostly attributable to real estate investors” and that “credit growth between 2001 and 2007 was concentrated in the prime segment, and debt to high-risk [subprime] borrowers was virtually constant for all debt categories during this period.” The authors argued that this investor-driven narrative was more accurate than blaming the crisis on lower-income, subprime borrowers. A 2011 Fed study had a similar finding: “In states that experienced the largest housing booms and busts, at the peak of the market almost half of purchase mortgage originations were associated with investors. In part by apparently misreporting their intentions to occupy the property, investors took on more leverage, contributing to higher rates of default.” The Fed study reported that mortgage originations to investors rose from 25% in 2000 to 45% in 2006, for Arizona, California, Florida, and Nevada overall, where housing price increases during the bubble (and declines in the bust) were most pronounced. In these states, investor delinquency rose from around 15% in 2000 to over 35% in 2007 and 2008. Nicole Gelinas of the Manhattan Institute described the negative consequences of not adjusting tax and mortgage policies to the shifting treatment of a home from conservative inflation hedge to speculative investment.Economist Robert Shiller argued that speculative bubbles are fueled by “contagious optimism, seemingly impervious to facts, that often takes hold when prices are rising. Bubbles are primarily social phenomena; until we understand and address the psychology that fuels them, they’re going to keep forming.” Keynesian economist Hyman Minsky described how speculative borrowing contributed to rising debt and an eventual collapse of asset values. A mortgage brokerage in the US advertising subprime mortgages in July 2008. In the years before the crisis, the behavior of lenders changed dramatically. Lenders offered more and more loans to higher-risk borrowers, including undocumented immigrants. Lending standards deteriorated particularly between 2004 and 2007, as the government-sponsored enterprise (GSE) mortgage market share (i.e. the share of Fannie Mae and Freddie Mac, which specialized in conventional, conforming, non-subprime mortgages) declined and private securitizers share grew, rising to more than half of mortgage securitizations. Subprime mortgages grew from 5% of total originations ($35 billion) in 1994, to 20% ($600 billion) in 2006. Another indicator of a “classic” boom-bust credit cycle, was a closing in the difference between subprime and prime mortgage interest rates (the “subprime markup”) between 2001 and 2007. In addition to considering higher-risk borrowers, lenders had offered progressively riskier loan options and borrowing incentives. In 2005, the median down payment for first-time home buyers was 2%, with 43% of those buyers making no down payment whatsoever. By comparison, China has down payment requirements that exceed 20%, with higher amounts for non-primary residences. To produce more mortgages and more securities, mortgage qualification guidelines became progressively looser. First, “stated income, verified assets” (SIVA) loans replaced proof of income with a “statement” of it. Then, “no income, verified assets” (NIVA) loans eliminated proof of employment requirements. Borrowers needed only to show proof of money in their bank accounts. “No Income, No Assets” (NINA) or Ninja loans eliminated the need to prove, or even to state any owned assets. All that was required for a mortgage was a credit score. Types of mortgages became more risky as well. The interest-only adjustable-rate mortgage (ARM), allowed the homeowner to pay only the interest (not principal) of the mortgage during an initial “teaser” period. Even looser was the “payment option” loan, in which the homeowner has the option to make monthly payment that do not even cover the interest for the first two or three year initial period of the loan. Nearly one in 10 mortgage borrowers in 2005 and 2006 took out these “option ARM” loans, and an estimated one-third of ARMs originated between 2004 and 2006 had “teaser” rates below 4%. After the initial period, monthly payments might double or even triple. The proportion of subprime ARM loans made to people with credit scores high enough to qualify for conventional mortgages with better terms increased from 41% in 2000 to 61% by 2006. In addition, mortgage brokers in some cases received incentives from lenders to offer subprime ARM’s even to those with credit ratings that merited a conforming (i.e., non-subprime) loan. Mortgage underwriting standards declined precipitously during the boom period. The use of automated loan approvals allowed loans to be made without appropriate review and documentation. In 2007, 40% of all subprime loans resulted from automated underwriting. The chairman of the Mortgage Bankers Association claimed that mortgage brokers, while profiting from the home loan boom, did not do enough to examine whether borrowers could repay. Mortgage fraud by lenders and borrowers increased enormously. The Financial Crisis Inquiry Commission reported in January 2011 that many mortgage lenders took eager borrowers’ qualifications on faith, often with a “willful disregard” for a borrower’s ability to pay. Nearly 25% of all mortgages made in the first half of 2005 were “interest-only” loans. During the same year, 68% of “option ARM” loans originated by Countrywide Financial and Washington Mutual had low- or no-documentation requirements. At least one study has suggested that the decline in standards was driven by a shift of mortgage securitization from a tightly controlled duopoly to a competitive market in which mortgage originators held the most sway. The worst mortgage vintage years coincided with the periods during which Government Sponsored Enterprises (specifically Fannie Mae and Freddie Mac) were at their weakest, and mortgage originators and private label securitizers were at their strongest. Why was there a market for these low quality private label securitizations? In a Peabody Award winning program, NPR correspondents argued that a “Giant Pool of Money” (represented by $70 trillion in worldwide fixed income investments) sought higher yields than those offered by U.S. Treasury bonds early in the decade. Further, this pool of money had roughly doubled in size from 2000 to 2007, yet the supply of relatively safe, income generating investments had not grown as fast. Investment banks on Wall Street answered this demand with financial innovation such as the mortgage-backed security (MBS) and collateralized debt obligation(CDO), which were assigned safe ratings by the credit rating agencies. 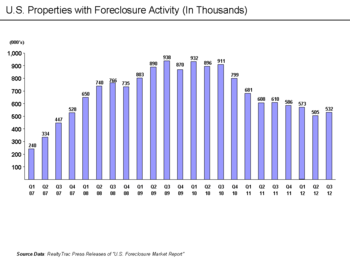 Number of U.S. residential properties subject to foreclosure actions by quarter (2007–2012). Subprime borrowers typically have weakened credit histories and reduced repayment capacity. Subprime loans have a higher risk of default than loans to prime borrowers. If a borrower is delinquent in making timely mortgage payments to the loan servicer (a bank or other financial firm), the lender may take possession of the property, in a process called foreclosure. The value of American subprime mortgages was estimated at $1.3 trillion as of March 2007, with over 7.5 million first-lien subprime mortgages outstanding.Between 2004 and 2006 the share of subprime mortgages relative to total originations ranged from 18%–21%, versus less than 10% in 2001–2003 and during 2007. The majority of subprime loans were issued in California. The boom in mortgage lending, including subprime lending, was also driven by a fast expansion of non-bank independent mortgage originators which despite their smaller share (around 25 percent in 2002) in the market have contributed to around 50 percent of the increase in mortgage credit between 2003 and 2005. In the third quarter of 2007, subprime ARMs making up only 6.9% of US mortgages outstanding also accounted for 43% of the foreclosures which began during that quarter. By October 2007, approximately 16% of subprime adjustable-rate mortgages (ARM) were either 90-days delinquent or the lender had begun foreclosureproceedings, roughly triple the rate of 2005. By January 2008, the delinquency rate had risen to 21% and by May 2008 it was 25%. According to RealtyTrac, the value of all outstanding residential mortgages, owed by U.S. households to purchase residences housing at most four families, was US$9.9 trillion as of year-end 2006, and US$10.6 trillion as of midyear 2008. During 2007, lenders had begun foreclosure proceedings on nearly 1.3 million properties, a 79% increase over 2006. This increased to 2.3 million in 2008, an 81% increase vs. 2007, and again to 2.8 million in 2009, a 21% increase vs. 2008. By August 2008, 9.2% of all U.S. mortgages outstanding were either delinquent or in foreclosure. By September 2009, this had risen to 14.4%. Between August 2007 and October 2008, 936,439 US residences completed foreclosure. Foreclosures are concentrated in particular states both in terms of the number and rate of foreclosure filings. Ten states accounted for 74% of the foreclosure filings during 2008; the top two (California and Florida) represented 41%. Nine states were above the national foreclosure rate average of 1.84% of households. The Financial Crisis Inquiry Commission reported in January 2011 that: “… mortgage fraud… flourished in an environment of collapsing lending standards and lax regulation. The number of suspicious activity reports – reports of possible financial crimes filed by depository banks and their affiliates – related to mortgage fraud grew 20-fold between 1996 and 2005 and then more than doubled again between 2005 and 2009. One study places the losses resulting from fraud on mortgage loans made between 2005 and 2007 at $112 billion. In a June 2008 speech, President of the NY Federal Reserve Bank Timothy Geithner, who later became Secretary of the Treasury, placed significant blame for the freezing of credit markets on a “run” on the entities in the “parallel” banking system, also called the shadow banking system. These entities became critical to the credit markets underpinning the financial system, but were not subject to the same regulatory controls as depository banks. Further, these entities were vulnerable because they borrowed short-term in liquid markets to purchase long-term, illiquid and risky assets. This meant that disruptions in credit markets would make them subject to rapid deleveraging, selling their long-term assets at depressed prices. He stated that the “combined effect of these factors was a financial system vulnerable to self-reinforcing asset price and credit cycles.” Nobel laureate economist Paul Krugman described the run on the shadow banking system as the “core of what happened” to cause the crisis. Fed Chair Ben Bernanke stated in an interview with the FCIC during 2009 that 12 of the 13 largest U.S. financial institutions were at risk of failure during 2008. The FCIC report did not identify which of the 13 firms was not considered by Bernanke to be in danger of failure. Borrowing under a securitization structure. 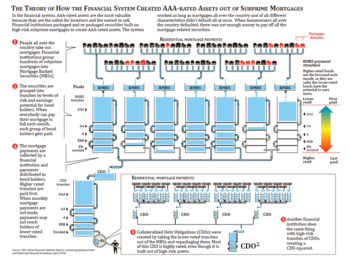 IMF diagram of CDO and RMBS. 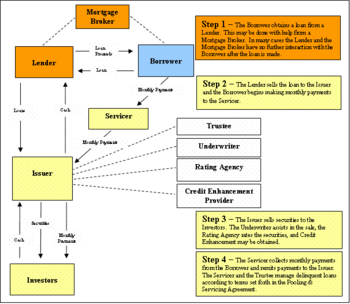 Securitization – the bundling of bank loans to create tradeable bonds – started in the mortgage industry in the 1970s, when Government Sponsored Enterprises (GSEs) began to pool relatively safe, conventional, “conforming” or “prime” mortgages, create “mortgage-backed securities” (MBS) from the pool, sell them to investors, guaranteeing these securities/bonds against default on the underlying mortgages. This “originate-to-distribute” model had advantages over the old “originate-to-hold” model, where a bank originated a loan to the borrower/homeowner and retained the credit (default) risk. Securitization removed the loans from a bank’s books, enabling the bank to remain in compliance with capital requirement laws. More loans could be made with proceeds of the MBS sale. The liquidity of a national and even international mortgage market allowed capital to flow where mortgages were in demand and funding short. However, securitization created a moral hazard – the bank/institution making the loan no longer had to worry if the mortgage was paid off – giving them incentive to process mortgage transactions but not to ensure their credit quality. Bankers were no longer around to work out borrower problems and minimize defaults during the course of the mortgage. With the high down payments and credit scores of the conforming mortgages used by GSE, this danger was minimal. Investment banks however, wanted to enter the market and avoid competing with the GSEs. They did so by developing mortgage-backed securities in the riskier non-conforming subprime and Alt-Amarket. Unlike the GSEs the issuers generally did not guarantee the securities against default of the underlying mortgages. What these “private label” or “non-agency” originators did do was to use “structured finance” to create securities. Structuring involved “slicing” the pooled mortgages into “tranches”, each having a different priority in the stream of monthly or quarterly principal and interest stream. Tranches were compared to “buckets” catching the “water” of principal and interest. More senior buckets didn’t share water with those below until they were filled to the brim and overflowing. This gave the top buckets/tranches considerable creditworthiness (in theory) that would earn the highest “triple A” credit ratings, making them salable to money market and pension funds that would not otherwise deal with subprime mortgage securities. To use up the MBS tranches lower in payback priority that could not be rated triple-A and that a conservative fixed income market would not buy, investment banks developed another security – known as the collateralized debt obligation (CDO). Although the CDO market was smaller, it was crucial because unless buyers were found for the non-triple-A or “mezzanine” tranches, it would not be profitable to make a mortgage-backed security in the first place. These CDOs pooled the leftover BBB, A-, etc. rated tranches, and produced new tranches – 70% to 80% of which were rated triple A by rating agencies. The 20–30% remaining mezzanine tranches were sometimes bought up by other CDOs, to make so-called “CDO-Squared” securities which also produced tranches rated mostly triple A. This process was later disparaged as “ratings laundering” or a way of transforming “dross into gold” by some business journalists, but was justified at the time by the belief that home prices would always rise. The model used by underwriters, rating agencies and investors to estimate the probability of mortgage default was based on the history of credit default swaps, which unfortunately went back “less than a decade, a period when house prices soared”. In addition the model – which postulated that the correlation of default risks among loans in securitization pools could be measure in a simple, stable, tractable number, suitable for risk management or valuation – also purported to show that the mortgages in CDO pools were well diversified or “uncorrelated”. Defaults on mortgages in Orlando, for example, were thought to have no effect on – i.e. were uncorrelated with – the real estate market across the country in Laguna Beach. When prices corrected (i.e. the bubble collapsed), the resulting defaults were not only larger in number than predicted but far more correlated. Still another innovative security criticized after the bubble burst was the synthetic CDO. Cheaper and easier to create than original “cash” CDOs, synthetics did not provide funding for housing, rather synthetic CDO-buying investors were in effect providing insurance (in the form of “credit default swaps“) against mortgage default. The mortgages they insured were those in “cash” CDOs the synthetics “referenced”. So instead of providing investors with interest and principal payments from MBS tranches, payments were the equivalent of insurance premiums from the insurance “buyers”. If the referenced CDOs defaulted, investors lost their investment, which was paid out to the insurance buyers. Unlike true insurance, credit default swaps were not regulated to insure that providers had the reserves to pay settlements, or that buyers owned the property (MBSs) they were insuring, i.e. were not simply making a bet a security would default. Because synthetics “referenced” another (cash) CDO, more than one – in fact numerous – synthetics could be made to reference the same original, multiplying the effect if a referenced security defaulted. As with MBS and other CDOs, triple A ratings for “large chunks” of synthetics were crucial to the securities’ success, because of the buyer/investors’ ignorance of the mortgage security market and trust in the credit rating agencies ratings. Securitization began to take off in the mid-1990s. The total amount of mortgage-backed securities issued almost tripled between 1996 and 2007, to $7.3 trillion. The securitized share of subprime mortgages (i.e., those passed to third-party investors via MBS) increased from 54% in 2001, to 75% in 2006. In the mid-2000s as the housing market was peaking, GSE securitization market share declined dramatically, while higher-risk subprime and Alt-A mortgage private label securitization grew sharply. As mortgage defaults began to rise, it was among mortgages securitized by the private banks. GSE mortgages – securitized or not – continued to perform better than the rest of the market. Picking up the slack for the dwindling cash CDO market synthetics were the dominant form of CDO’s by 2006, valued “notionally“ at an estimated $5 trillion. By the autumn of 2008, when the securitization market “seized up” and investors would “no longer lend at any price”, securitized lending made up about $10 trillion of the roughly $25 trillion American credit market, (i.e. what “American homeowners, consumers, and corporations owed”). In February 2009, Ben Bernanke stated that securitization markets remained effectively shut, with the exception of conforming mortgages, which could be sold to Fannie Mae and Freddie Mac. Criticizing the argument that complex structured investment securitization was instrumental in the mortgage crisis, Paul Krugman points out that the Wall Street firms issuing the securities “kept the riskiest assets on their own books”, and that neither of the equally disastrous bubbles in European housing or US commercial property used complex structured securities. Krugman does agree that it is “arguable is that financial innovation … spread the bust to financial institutions around the world” and its inherent fragmentation of loans has made post-bubble “cleanup” through debt renegotiation extremely difficult. Many financial institutions, investment banks in particular, issued large amounts of debt during 2004–07, and invested the proceeds in mortgage-backed securities(MBS), essentially betting that house prices would continue to rise, and that households would continue to make their mortgage payments. Borrowing at a lower interest rate and investing the proceeds at a higher interest rate is a form of financial leverage. This is analogous to an individual taking out a second mortgage on his residence to invest in the stock market. This strategy proved profitable during the housing boom, but resulted in large losses when house prices began to decline and mortgages began to default. Beginning in 2007, financial institutions and individual investors holding MBS also suffered significant losses from mortgage payment defaults and the resulting decline in the value of MBS. A 2004 U.S. Securities and Exchange Commission (SEC) decision related to the net capital rule allowed US investment banks to issue substantially more debt, which was then used to purchase MBS. 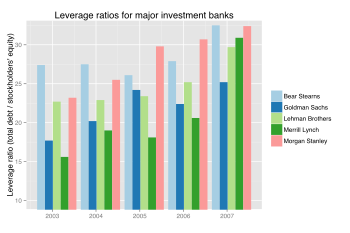 Over 2004–07, the top five US investment banks each significantly increased their financial leverage (see diagram), which increased their vulnerability to the declining value of MBSs. These five institutions reported over $4.1 trillion in debt for fiscal year 2007, about 30% of US nominal GDP for 2007. Further, the percentage of subprime mortgages originated to total originations increased from below 10% in 2001–03 to between 18–20% from 2004 to 2006, due in-part to financing from investment banks. During 2008, three of the largest U.S. investment banks either went bankrupt (Lehman Brothers) or were sold at fire sale prices to other banks (Bear Stearns and Merrill Lynch). These failures augmented the instability in the global financial system. The remaining two investment banks, Morgan Stanley and Goldman Sachs, opted to become commercial banks, thereby subjecting themselves to more stringent regulation. In the years leading up to the crisis, the top four U.S. depository banks moved an estimated $5.2 trillion in assets and liabilities off-balance sheet into special purpose vehicles or other entities in the shadow banking system. This enabled them to essentially bypass existing regulations regarding minimum capital ratios, thereby increasing leverage and profits during the boom but increasing losses during the crisis. New accounting guidance will require them to put some of these assets back onto their books during 2009, which will significantly reduce their capital ratios. One news agency estimated this amount to be between $500 billion and $1 trillion. This effect was considered as part of the stress tests performed by the government during 2009. The incentive compensation of traders was focused on fees generated from assembling financial products, rather than the performance of those products and profits generated over time. Their bonuses were heavily skewed towards cash rather than stock and not subject to “claw-back” (recovery of the bonus from the employee by the firm) in the event the MBS or CDO created did not perform. In addition, the increased risk (in the form of financial leverage) taken by the major investment banks was not adequately factored into the compensation of senior executives. Credit default swaps (CDS) are financial instruments used as a hedge and protection for debtholders, in particular MBS investors, from the risk of default, or by speculators to profit from default. As the net worth of banks and other financial institutions deteriorated because of losses related to subprime mortgages, the likelihood increased that those providing the protection would have to pay their counterparties. This created uncertainty across the system, as investors wondered which companies would be required to pay to cover mortgage defaults. Like all swaps and other financial derivatives, CDS may either be used to hedge risks (specifically, to insure creditors against default) or to profit from speculation. 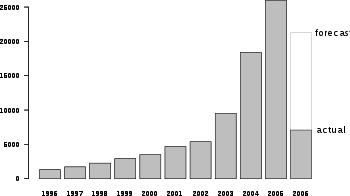 The volume of CDS outstanding increased 100-fold from 1998 to 2008, with estimates of the debt covered by CDS contracts, as of November 2008, ranging from US$33 to $47 trillion. CDS are lightly regulated, largely because of the Commodity Futures Modernization Act of 2000. As of 2008, there was no central clearing house to honor CDS in the event a party to a CDS proved unable to perform his obligations under the CDS contract. Required disclosure of CDS-related obligations has been criticized as inadequate. Insurance companies such as American International Group (AIG), MBIA, and Ambac faced ratings downgrades because widespread mortgage defaults increased their potential exposure to CDS losses. These firms had to obtain additional funds (capital) to offset this exposure. AIG’s having CDSs insuring $440 billion of MBS resulted in its seeking and obtaining a Federal government bailout. The monoline insurance companies went out of business in 2008–2009. When investment bank Lehman Brothers went bankrupt in September 2008, there was much uncertainty as to which financial firms would be required to honor the CDS contracts on its $600 billion of bonds outstanding.Merrill Lynch‘s large losses in 2008 were attributed in part to the drop in value of its unhedged portfolio of collateralized debt obligations (CDOs) after AIG ceased offering CDS on Merrill’s CDOs. The loss of confidence of trading partners in Merrill Lynch’s solvency and its ability to refinance its short-term debt led to its acquisition by the Bank of America. Author Michael Lewis wrote that CDS enabled speculators to stack bets on the same mortgage bonds and CDO’s. This is analogous to allowing many persons to buy insurance on the same house. Speculators that bought CDS insurance were betting that significant defaults would occur, while the sellers (such as AIG) bet they would not. A theoretically infinite amount could be wagered on the same housing-related securities, provided buyers and sellers of the CDS could be found. Derivatives such as CDS were unregulated or barely regulated. Several sources have noted the failure of the US government to supervise or even require transparency of the financial instruments known as derivatives. A 2008 investigative article in the Washington Post found that leading government officials at the time (Federal Reserve Board Chairman Alan Greenspan, Treasury Secretary Robert Rubin, and SECChairman Arthur Levitt) vehemently opposed any regulation of derivatives. In 1998 Brooksley E. Born, head of the Commodity Futures Trading Commission, put forth a policy paper asking for feedback from regulators, lobbyists, legislators on the question of whether derivatives should be reported, sold through a central facility, or whether capital requirements should be required of their buyers. Greenspan, Rubin, and Levitt pressured her to withdraw the paper and Greenspan persuaded Congress to pass a resolution preventing CFTC from regulating derivatives for another six months – when Born’s term of office would expire. Ultimately, it was the collapse of a specific kind of derivative, the mortgage-backed security, that triggered the economic crisis of 2008. In addition, Chicago Public Radio, Huffington Post, and ProPublica reported in April 2010 that market participants, including a hedge fund called Magnetar Capital, encouraged the creation of CDO’s containing low quality mortgages, so they could bet against them using CDS. NPR reported that Magnetar encouraged investors to purchase CDO’s while simultaneously betting against them, without disclosing the latter bet. Instruments called synthetic CDO, which are portfolios of credit default swaps, were also involved in allegations by the SEC against Goldman-Sachs in April 2010. The Financial Crisis Inquiry Commission reported in January 2011 that CDS contributed significantly to the crisis. Companies were able to sell protection to investors against the default of mortgage-backed securities, helping to launch and expand the market for new, complex instruments such as CDO’s. This further fueled the housing bubble. They also amplified the losses from the collapse of the housing bubble by allowing multiple bets on the same securities and helped spread these bets throughout the financial system. Companies selling protection, such as AIG, were not required to set aside sufficient capital to cover their obligations when significant defaults occurred. Because many CDS were not traded on exchanges, the obligations of key financial institutions became hard to measure, creating uncertainty in the financial system. Credit rating agencies – firms which rate debt instruments/securities according to the debtor’s ability to pay lenders back – have come under scrutiny during and after the financial crisis for having given investment-grade ratings to MBSs and CDOs based on risky subprime mortgage loans that later defaulted. Dozens of lawsuits have been filed by investors against the “Big Three” rating agencies – Moody’s Investors Service, Standard & Poor’s, and Fitch Ratings. The Financial Crisis Inquiry Commission (FCIC) concluded the “failures” of the Big Three rating agencies were “essential cogs in the wheel of financial destruction” and “key enablers of the financial meltdown”. Economist Joseph Stiglitz called them “one of the key culprits” of the financial crisis. Others called their ratings “catastrophically misleading”, (the U.S. Securities and Exchange Commissioner), their performance “horrendous” (The Economist magazine). There are indications that some involved in rating subprime-related securities knew at the time that the rating process was faulty. The position of the three agencies “between the issuers and the investors of securities” “transformed” them into “key” players in the housing bubble and financial crisis according to the Financial Crisis Inquiry Report. Most investors in the fixed income market had no experience with the mortgage business – let alone dealing with the complexity of pools of mortgages and tranche priority of MBS and CDO securities – and were simply looking for an independent party who could rate securities. The putatively independent parties meanwhile were paid “handsome fees” by investment banks “to obtain the desired ratings”, according to one expert. In addition, a large section of the debt securities market – many money markets and pension funds – were restricted in their bylaws to holding only the safest securities – i.e securities the rating agencies designated “triple-A”. Hence non-prime securities could not be sold without ratings by (usually two of) the three agencies. From 2000 to 2007, one of the largest agencies – Moody’s – rated nearly 45,000 mortgage-related securities – more than half of those it rated – as triple-A. By December 2008, there were over $11 trillion structured finance securities outstanding in the U.S. bond market debt. But as the boom matured, mortgage underwriting standards deteriorated. By 2007 an estimated $3.2 trillion in loans were made to homebuyers and owners with bad credit and undocumented incomes, bundled into MBSs and CDOs, and given top ratings to appeal to global investors. As these mortgages began to default, the three agencies were compelled to go back and redo their ratings. 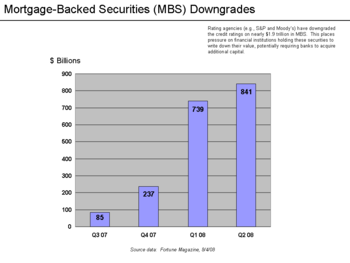 Between autumn of 2007 and the middle of 2008, agencies downgraded nearly $2 trillion in MBS tranches. By the end of 2008, 80% of the CDOs by value rated “triple-A” were downgraded to junk. Bank writedowns and losses on these investments totaled $523 billion. Critics such as the Financial Crisis Inquiry Commission argue the mistaken credit ratings stemmed from “flawed computer models, the pressure from financial firms that paid for the ratings, the relentless drive for market share, the lack of resources to do the job despite record profits, and the absence of meaningful public oversight”. Structured investment was very profitable to the agencies and by 2007 accounted for just under half of Moody’s total ratings revenue and all of the revenue growth. But profits were not guaranteed, and issuers played the agencies off one another, ‘shopping’ around to find the best ratings, sometimes openly threatening to cut off business after insufficiently generous ratings. Thus there was a conflict of interest between accommodating clients – for whom higher ratings meant higher earnings – and accurately rating the debt for the benefit of the debt buyer/investors – who provided zero revenue to the agencies. Despite the profitability of the three big credit agencies – Moody’s operating margins were consistently over 50%, higher than famously successful Exxon Mobil or Microsoft – salaries and bonuses for non-management were significantly lower than at Wall Street banks, and its employees complained of overwork. This incentivized agency rating analysts to seek employment at those Wall Street banks who were issuing mortgage securities, and who were particularly interested in the analysts’ knowledge of what criteria their former employers used to rate securities. Inside knowledge of interest to security issuers eager to find loopholes included the fact that rating agencies looked at the average credit score of a pool of borrowers, but not how dispersed it was; that agencies ignored borrower’s household income or length of credit history (explaining the large numbers of low income immigrants given mortgages—people “who had never failed to repay a debt, because they had never been given a loan”); that agencies were indifferent to credit worthiness issues of adjustable-rate mortgages with low teaser rates, “silent second” mortgages, or no-documentation mortgages. As of 2010, virtually all of the investigations of rating agencies, criminal as well as civil, are in their early stages. In New York, state prosecutors are examining whether eight banks duped the credit ratings agencies into inflating the grades of subprime-linked investments. In the dozens of suits filed against them by investors involving claims of inaccurate ratings the rating agencies have defended themselves using the First Amendmentdefense—that a credit rating is an opinion protected as free speech. In 2013, McClatchy Newspapers found that “little competition has emerged” since the Credit Rating Agency Reform Act of 2006 was passed “in rating the kinds of complex home-mortgage securities whose implosion led to the 2007 financial crisis”. The Big Three’s market share of outstanding credit rating has barely shrunk, moving from 98% to 97%. 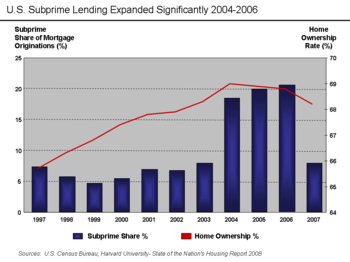 U.S. Subprime lending expanded dramatically 2004–2006. Government over-regulation, failed regulation and deregulation have all been claimed as causes of the crisis. Increasing home ownership has been the goal of several presidents including Roosevelt, Reagan, Clinton and George W. Bush. Those of us who have looked to the self-interest of lending institutions to protect shareholders’ equity, myself included, are in a state of shocked disbelief. Several steps were taken to reduce the regulation applied to banking institutions in the years leading up to the crisis. Further, major investment banks which collapsed during the crisis were not subject to the regulations applied to depository banks. In testimony before Congress both the Securities and Exchange Commission (SEC) and Alan Greenspan claimed failure in allowing the self-regulation of investment banks. In 1982, Congress passed the Alternative Mortgage Transactions Parity Act (AMTPA), which allowed non-federally chartered housing creditors to write adjustable-rate mortgages. 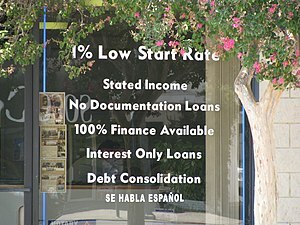 This bi-partisan legislation was, according to the Urban Institute, intended to “increase the volume of loan products that reduced the up-front costs to borrowers in order to make homeownership more affordable.” Among the new mortgage loan types created and gaining in popularity in the early 1980s were adjustable-rate, option adjustable-rate, balloon-payment and interest-only mortgages. Subsequent widespread abuses of predatory lending occurred with the use of adjustable-rate mortgages. Approximately 90% of subprime mortgages issued in 2006 were adjustable-rate mortgages. The Commodity Futures Modernization Act of 2000 was bi-partisan legislation that formally exempted derivatives from regulation, supervision, trading on established exchanges, and capital reserve requirements for major participants. It “provided a legal safe harbor for treatment already in effect.” Concerns that counterparties to derivative deals would be unable to pay their obligations caused pervasive uncertainty during the crisis. Particularly relevant to the crisis are credit default swaps (CDS), a derivative in which Party A pays Party B what is essentially an insurance premium, in exchange for payment should Party C default on its obligations. Warren Buffett famously referred to derivatives as “financial weapons of mass destruction” in early 2003. Some analysts believe the subprime mortgage crisis was due, in part, to a 2004 decision of the SEC that affected 5 large investment banks. The critics believe that changes in the capital reserve calculation rules enabled investment banks to substantially increase the level of debt they were taking on, fueling the growth in mortgage-backed securities supporting subprime mortgages. These banks dramatically increased their risk taking from 2003 to 2007. By the end of 2007, the largest five U.S. investment banks had over $4 trillion in debt with high ratios of debt to equity, meaning only a small decline in the value of their assets would render them insolvent.However, in an April 9, 2009 speech, Erik Sirri, then Director of the SEC’s Division of Trading and Markets, argued that the regulatory weaknesses in leverage restrictions originated in the late 1970s: “The Commission did not undo any leverage restrictions in 2004,” nor did it intend to make a substantial reduction. Several administrations, both Democratic and Republican, advocated affordable housing policies in the years leading up to the crisis. The Housing and Community Development Act of 1992 established, for the first time, an affordable housing loan purchase mandate for Fannie Mae and Freddie Mac, a mandate to be regulated by the Department of Housing and Urban Development (HUD). Initially, the 1992 legislation required that 30 percent or more of Fannie’s and Freddie’s loan purchases be related to affordable housing. However, HUD was given the power to set future requirements. 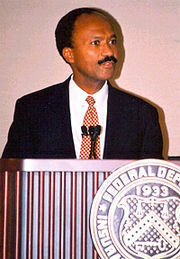 During the later part of the Clinton Administration, HUD Secretary Andrew Cuomoannounced “new regulations to provide $2.4 trillion in mortgages for affordable housing for 28.1 million families, which increased the required percentage of mortgage loans for low- and moderate-income families that finance companies Fannie Mae and Freddie Mac must buy annually from the then current 42 percent of their total purchases to a new high of 50 percent. Eventually (under the Bush Administration) a 56 percent minimum was established. Additionally, in 2003, “The Bush administration today recommended the most significant regulatory overhaul in the housing finance industry since the savings and loan crisis a decade ago.”. The Financial Crisis Inquiry Commission (majority report), Federal Reserve economists, and several academic researchers have stated that government affordable housing policies were not the major cause of the financial crisis. They also state that Community Reinvestment Act loans outperformed other “subprime” mortgages, and GSE mortgages performed better than private label securitizations. The Community Reinvestment Act (CRA) was originally enacted under President Jimmy Carter in 1977 in an effort to encourage banks to halt the practice of lending discrimination. In 1995 the Clinton Administration issued regulations that added numerical guidelines, urged lending flexibility, and instructed bank examiners to evaluate a bank’s responsiveness to community activists (such as ACORN) when deciding whether to approve bank merger or expansion requests. Critics claim that the 1995 changes to CRA signaled to banks that relaxed lending standards were appropriate and could minimize potential risk of governmental sanctions. Conservatives and libertarians have debated the possible effects of the CRA, with detractors claiming that the Act encouraged lending to uncreditworthy borrowers, and defenders claiming a thirty-year history of lending without increased risk. Detractors also claim that amendments to the CRA in the mid-1990s, raised the amount of mortgages issued to otherwise unqualified low-income borrowers, and allowed the securitization of CRA-regulated mortgages, even though a fair number of them were subprime. Critics claim that the use of the high-interest-rate proxy distorts results because government programs generally promote low-interest rate loans—even when the loans are to borrowers who are clearly subprime. However, several economists maintain that Community Reinvestment Act loans outperformed other “subprime” mortgages, and GSE mortgages performed better than private label securitizations. However, economists at the National Bureau of Economic Research concluded that banks undergoing CRA-related regulatory exams took additional mortgage lending risk. The authors of a study entitled “Did the Community Reinvestment Act Lead to Risky Lending?” compared “the lending behavior of banks undergoing CRA exams within a given census tract in a given month (the treatment group) to the behavior of banks operating in the same census tract-month that did not face these exams (the control group). This comparison clearly indicates that adherence to the CRA led to riskier lending by banks.” They concluded: “The evidence shows that around CRA examinations, when incentives to conform to CRA standards are particularly high, banks not only increase lending rates but also appear to originate loans that are markedly riskier.” Loan delinquency averaged 15% higher in the treatment group than the control group one year after mortgage origination. Fannie Mae and Freddie Mac are government sponsored enterprises (GSE) that purchase mortgages, buy and sell mortgage-backed securities (MBS), and guarantee nearly half of the mortgages in the U.S. A variety of political and competitive pressures resulted in the GSEs ramping up their purchase and guarantee of risky mortgages in 2005 and 2006, just as the housing market was peaking. Fannie and Freddie were both under political pressure to expand purchases of higher-risk affordable housing mortgage types, and under significant competitive pressure from large investment banks and mortgage lenders. Nine of the ten members of the Financial Crisis Inquiry Commission reported in 2011 that Fannie and Freddie “contributed to the crisis, but were not a primary cause”, or that since “credit spreads declined not just for housing, but also for other asset classes like commercial real estate … problems with U.S. housing policy or markets [could] not by themselves explain the U.S. housing bubble.” According to the Commission, GSE mortgage securities essentially maintained their value throughout the crisis and did not contribute to the significant financial firm losses that were central to the financial crisis. The GSEs participated in the expansion of subprime and other risky mortgages, but they followed rather than led Wall Street and other lenders into subprime lending. Several studies by the Government Accountability Office (GAO), Harvard Joint Center for Housing Studies, the Federal Housing Finance Agency, and several academic institutions summarized by economist Mike Konczal of the Roosevelt Institute, indicate Fannie and Freddie were not to blame for the crisis. A 2011 statistical comparisons of regions of the US which were subject to GSE regulations with regions that were not, done by the Federal Reserve, found that GSEs played no significant role in the subprime crisis. In 2008, David Goldstein and Kevin G. Hall reported that more than 84 percent of the subprime mortgages came from private lending institutions in 2006, and the share of subprime loans insured by Fannie Mae and Freddie Mac decreased as the bubble got bigger (from a high of insuring 48 percent to insuring 24 percent of all subprime loans in 2006). In 2008, another source found estimates by some analysts that Fannie’s share of the subprime mortgage-backed securities market dropped from a peak of 44% in 2003 to 22% in 2005, before rising to 33% in 2007. Whether GSEs played a small role in the crisis because they were legally barred from engaging in subprime lending is disputed. Economist Russell Roberts cites a June 2008 Washington Post article which stated that “[f]rom 2004 to 2006, the two [GSEs] purchased $434 billion in securities backed by subprime loans, creating a market for more such lending.” Furthermore, a 2004 HUD report admitted that while trading securities that were backed by subprime mortgages was something that the GSEs officially disavowed, they nevertheless participated in the market. In his lone dissent to the majority and minority opinions of the FCIC, Peter J. Wallison of the American Enterprise Institute (AEI) blamed U.S. housing policy, including the actions of Fannie and Freddie, primarily for the crisis, writing: “When the bubble began to deflate in mid-2007, the low quality and high risk loans engendered by government policies failed in unprecedented numbers. The effect of these defaults was exacerbated by the fact that few if any investors – including housing market analysts – understood at the time that Fannie Mae and Freddie Mac had been acquiring large numbers of subprime and other high risk loans in order to meet HUD’s affordable housing goals.” His dissent relied heavily on the research of fellow AEI member Edward Pinto, the former Chief Credit Officer of Fannie Mae. Pinto estimated that by early 2008 there were 27 million higher-risk, “non-traditional” mortgages (defined as subprime and Alt-A) outstanding valued at $4.6 trillion. Of these, Fannie & Freddie held or guaranteed 12 million mortgages valued at $1.8 trillion. Government entities held or guaranteed 19.2 million or $2.7 trillion of such mortgages total. One counter-argument to Wallison and Pinto’s analysis is that the credit bubble was global and also affected the U.S. commercial real estate market, a scope beyond U.S. government housing policy pressures. The three Republican authors of the dissenting report to the FCIC majority opinion wrote in January 2011: “Credit spreads declined not just for housing, but also for other asset classes like commercial real estate. This tells us to look to the credit bubble as an essential cause of the U.S. housing bubble. It also tells us that problems with U.S. housing policy or markets do not by themselves explain the U.S. housing bubble.” Economist Paul Krugman wrote in January 2010 that Fannie Mae, Freddie Mac, CRA, or predatory lending were not primary causes of the bubble/bust in residential real estate because there was a bubble of similar magnitude in commercial real estate in America. Central banks manage monetary policy and may target the rate of inflation. They have some authority over commercial banks and possibly other financial institutions. They are less concerned with avoiding asset price bubbles, such as the housing bubble and dot-com bubble. Central banks have generally chosen to react after such bubbles burst so as to minimize collateral damage to the economy, rather than trying to prevent or stop the bubble itself. This is because identifying an asset bubble and determining the proper monetary policy to deflate it are matters of debate among economists. A contributing factor to the rise in house prices was the Federal Reserve’s lowering of interest rates early in the decade. 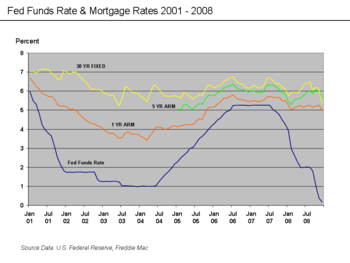 From 2000 to 2003, the Federal Reserve lowered the federal funds rate target from 6.5% to 1.0%. This was done to soften the effects of the collapse of the dot-com bubble and of the September 2001 terrorist attacks, and to combat the perceived risk of deflation. The Fed believed that interest rates could be lowered safely primarily because the rate of inflation was low; it disregarded other important factors. According to Richard W. Fisher, President and CEO of the Federal Reserve Bank of Dallas, the Fed’s interest rate policy during the early 2000s (decade) was misguided, because measured inflation in those years was below true inflation, which led to a monetary policy that contributed to the housing bubble. Ben Bernanke and Alan Greenspan — both former chairmen of the Federal Reserve — disagree, arguing decisions on purchasing a home depends on long-term interest rates on mortgages not the short-term rates controlled by the Fed. According to Greenspan, “between 1971 and 2002, the fed funds rate and the mortgage rate moved in lock-step,” but when the Fed started to raise rates in 2004, mortgage rates diverged, continuing to fall (or at least rise) for another year (see “Fed Funds Rate & Mortgage Rates” graph). Construction of new homes didn’t peak until January 2006. Bernanke speculates that a world wide “saving glut” pushed capital or savings into the United States, keeping long-term interest rates low and independent of Central Bank action. Agreeing with Fisher that the low interest rate policy of the Greenspan Fed both allowed and motivated investors to seek out risk investments offering higher returns, is finance economist Raghuram Rajan who argues that the underlying causes of the American economy’s tendency to go “from bubble to bubble” fueled by unsustainable monetary stimulation, are the “weak safety nets” for the unemployed, which made “the US political system … acutely sensitive to job growth”; and attempts to compensate for the stagnant income of the middle and lower classes with easy credit to boost their consumption. Economist Thomas Sowell wrote that the Fed’s decision to steadily raise interest rates was a key factor that ended the housing bubble. The Fed raised rates from the unusually low level of one percent in 2004 to a more typical 5.25% in 2006. By driving mortgage rates higher, the Fed “made monthly mortgage payments more expensive and therefore reduced the demand for housing.” He referred to the Fed action as the “nudge” that collapsed the “house of cards” created by lax lending standards, affordable housing policies, and the preceding period of low interest rates. Former Federal Deposit Insurance Corporation Chair William Isaac placed much of the blame for the subprime mortgage crisis on the Securities and Exchange Commission and its fair-value accounting rules, especially the requirement for banks to mark their assets to market, particularly mortgage-backed securities. Whether or not this is true has been the subject of ongoing debate. The debate arises because this accounting rule requires companies to adjust the value of marketable securities (such as the mortgage-backed securities (MBS) at the center of the crisis) to their market value. The intent of the standard is to help investors understand the value of these assets at a point in time, rather than just their historical purchase price. Because the market for these assets is distressed, it is difficult to sell many MBS at other than prices which may (or may not) be reflective of market stresses, which may be below the value that the mortgage cash flow related to the MBS would merit. As initially interpreted by companies and their auditors, the typically lower sale value was used as the market value rather than the cash flow value. Many large financial institutions recognized significant losses during 2007 and 2008 as a result of marking-down MBS asset prices to market value. 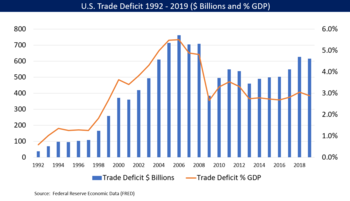 In 2005, Ben Bernanke addressed the implications of the United States’s high and rising current account deficit, resulting from U.S. investment exceeding its savings, or imports exceeding exports. Between 1996 and 2004, the U.S. current account deficit increased by $650 billion, from 1.5% to 5.8% of GDP. The U.S. attracted a great deal of foreign investment, mainly from the emerging economies in Asia and oil-exporting nations. The balance of payments identity requires that a country (such as the U.S.) running a current account deficit also have a capital account (investment) surplus of the same amount. Foreign investors had these funds to lend, either because they had very high personal savings rates (as high as 40% in China), or because of high oil prices. Bernanke referred to this as a “saving glut“ that may have pushed capital into the United States, a view differing from that of some other economists, who view such capital as having been pulled into the U.S. by its high consumption levels. In other words, a nation cannot consume more than its income unless it sells assets to foreigners, or foreigners are willing to lend to it. Alternatively, if a nation wishes to increase domestic investment in plant and equipment, it will also increase its level of imports to maintain balance if it has a floating exchange rate. Regardless of the push or pull view, a “flood” of funds (capital or liquidity) reached the U.S. financial market. Foreign governments supplied funds by purchasing U.S. Treasury bonds and thus avoided much of the direct impact of the crisis. American households, on the other hand, used funds borrowed from foreigners to finance consumption or to bid up the prices of housing and financial assets. Financial institutions invested foreign funds in mortgage-backed securities. American housing and financial assets dramatically declined in value after the housing bubble burst. Economist Joseph Stiglitz wrote in October 2011 that the recession and high unemployment of the 2009–2011 period was years in the making and driven by: unsustainable consumption; high manufacturing productivity outpacing demand thereby increasing unemployment; income inequality that shifted income from those who tended to spend it (i.e., the middle class) to those who do not (i.e., the wealthy); and emerging market’s buildup of reserves (to the tune of $7.6 trillion by 2011) which was not spent. These factors all led to a “massive” shortfall in aggregate demand, which was “papered over” by demand related to the housing bubble until it burst. Financial market stresses became apparent during 2007 that resulted in sizable losses across the financial system, the bankruptcy of over 100 mortgage lenders and the emergency sale of investment bank Bear Stearns in March 2008 to depository bank JP Morgan Chase. Some writers began calling the events in the financial markets during this period the “Subprime Mortgage Crisis” or the “Mortgage crisis”. As U.S. housing prices began to fall from their 2006 peak, global investors became less willing to invest in mortgage-backed securities (MBS). The crisis began to affect the financial sector in February 2007, when HSBC, one of the world’s largest banks, wrote down its holdings of subprime-related mortgage securities by $10.5 billion, the first major subprime related loss to be reported. By April 2007, over 50 mortgage companies had declared bankruptcy, many of which had specialized in subprime mortgages, the largest of which was New Century Financial. At least 100 mortgage companies either shut down, suspended operations or were sold during 2007. These mortgage companies made money on the origination and sale of mortgages, rather than interest from holding the mortgage. They had relied on continuing access to this global pool of investor capital to continue their operations; when investor capital dried-up, they were forced into bankruptcy. Other parts of the shadow banking system also encountered difficulty. Legal entities known as structured investment vehicles (SIV) and hedge funds had borrowed from investors and bought MBS. When mortgage defaults rose along with the fall in housing prices, the value of the MBS declined. Investors demanded that these entities put up additional collateral or be forced to pay back the investors immediately, a form of margin call. This resulted in further sales of MBS, which lowered MBS prices further. This dynamic of margin call and price reductions contributed to the collapse of two Bear Stearns hedge funds in July 2007, an event which economist Mark Zandi referred to as “arguably the proximate catalyst” of the crisis in financial markets. On August 9, 2007 French bank BNP Paribas announced that it was halting redemptions on three investment funds due to subprime problems, another “beginning point” of the crisis to some observers. Investment banks such as Bear Stearns had legal obligations to provide financial support to these entities, which created a cash drain. Bear Stearns reported the first quarterly loss in its history during November 2007 and obtained additional financing from a Chinese sovereign wealth fund. Investment banks Merrill Lynch and Morgan Stanley had also obtained additional capital from sovereign wealth funds in Asia and the Middle East during late 2007. 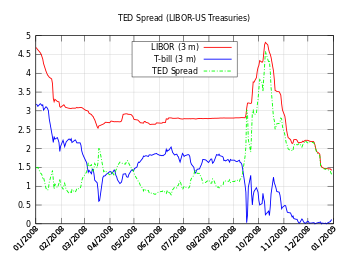 The TED spread (the difference between the interest rates on interbank loans and on the safer short-term U.S. government debt) – an indicator of credit risk – increased dramatically during September 2008. Financial market conditions continued to worsen during 2008. By August 2008, financial firms around the globe had written down their holdings of subprime related securities by US$501 billion. The IMF estimated that financial institutions around the globe would eventually have to write off $1.5 trillion of their holdings of subprime MBSs. About $750 billion in such losses had been recognized as of November 2008. These losses wiped out much of the capital of the world banking system. Banks headquartered in nations that have signed the Basel Accords must have so many cents of capital for every dollar of credit extended to consumers and businesses. Thus the massive reduction in bank capital just described has reduced the credit available to businesses and households. The crisis hit a critical point in September 2008 with the failure, buyout or bailout of the largest entities in the U.S. shadow banking system. Investment bank Lehman Brothers failed, while Merrill Lynch was purchased by Bank of America. Investment banks Goldman Sachs and Morgan Stanley obtained depository bank holding charters, which gave them access to emergency lines of credit from the Federal Reserve. Government-sponsored enterprises Fannie Mae and Freddie Mac were taken over by the federal government. Insurance giant AIG, which had sold insurance-like protection for mortgage-backed securities, did not have the capital to honor its commitments; U.S. taxpayers covered its obligations instead in a bailout that exceeded $100 billion. Further, there was the equivalent of a bank run on other parts of the shadow system, which severely disrupted the ability of non-financial institutions to obtain the funds to run their daily operations. During a one-week period in September 2008, $170 billion were withdrawn from US money funds, causing the Federal Reserve to announce that it would guarantee these funds up to a point. 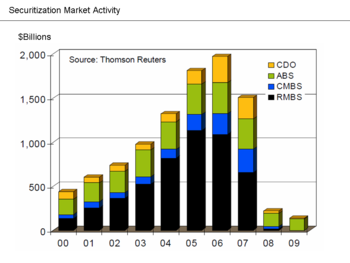 The money market had been a key source of credit for banks (CDs) and nonfinancial firms (commercial paper). The TED spread (see graph above), a measure of the risk of interbank lending, quadrupled shortly after the Lehman failure. This credit freeze brought the global financial system to the brink of collapse. In a dramatic meeting on September 18, 2008, Treasury Secretary Henry Paulson and Fed Chairman Ben Bernanke met with key legislators to propose a $700 billion emergency bailout of the banking system. Bernanke reportedly told them: “If we don’t do this, we may not have an economy on Monday.” The Emergency Economic Stabilization Act, also called the Troubled Asset Relief Program (TARP), was signed into law on October 3, 2008. In a nine-day period from Oct. 1–9, the S&P 500 fell a staggering 251 points, losing 21.6% of its value. The week of Oct. 6–10 saw the largest percentage drop in the history of the Dow Jones Industrial Average – even worse than any single week in the Great Depression. The response of the US Federal Reserve, the European Central Bank, and other central banks was dramatic. During the last quarter of 2008, these central banks purchased US$2.5 trillion of government debt and troubled private assets from banks. This was the largest liquidity injection into the credit market, and the largest monetary policy action, in world history. The governments of European nations and the US also raised the capital of their national banking systems by $1.5 trillion, by purchasing newly issued preferred stock in their major banks. On Dec. 16, 2008, the Federal Reserve cut the Federal funds rate to 0–0.25%, where it remained until December 2015; this period of zero interest-rate policy was unprecedented in U.S. history. The International Monetary Fund estimated that large U.S. and European banks lost more than $1 trillion on toxic assets and from bad loans from January 2007 to September 2009. These losses were expected to top $2.8 trillion from 2007 to 2010. U.S. banks losses were forecast to hit $1 trillion and European bank losses will reach $1.6 trillion. The IMF estimated that U.S. banks were about 60 percent through their losses, but British and eurozone banks only 40 percent. Between June 2007 and November 2008, Americans lost more than a quarter of their net worth. By early November 2008, a broad U.S. stock index, the S&P 500, was down 45 percent from its 2007 high. Housing prices had dropped 20% from their 2006 peak, with futures markets signaling a 30–35% potential drop. Total home equity in the United States, which was valued at $13 trillion at its peak in 2006, had dropped to $8.8 trillion by mid-2008 and was still falling in late 2008. Total retirement assets, Americans’ second-largest household asset, dropped by 22 percent, from $10.3 trillion in 2006 to $8 trillion in mid-2008. During the same period, savings and investment assets (apart from retirement savings) lost $1.2 trillion and pension assets lost $1.3 trillion. Taken together, these losses total $8.3 trillion. 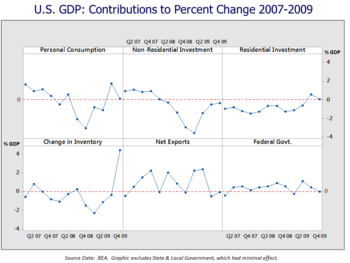 Real gross domestic product (GDP) began contracting in the third quarter of 2008 and did not return to growth until Q1 2010. CBO estimated in February 2013 that real U.S. GDP remained 5.5% below its potential level, or about $850 billion. CBO projected that GDP would not return to its potential level until 2017. The unemployment rate rose from 5% in 2008 pre-crisis to 10% by late 2009, then steadily declined to 7.6% by March 2013. The number of unemployed rose from approximately 7 million in 2008 pre-crisis to 15 million by 2009, then declined to 12 million by early 2013. Residential private investment (mainly housing) fell from its 2006 pre-crisis peak of $800 billion, to $400 billion by mid-2009 and has remained depressed at that level. Non-residential investment (mainly business purchases of capital equipment) peaked at $1,700 billion in 2008 pre-crisis and fell to $1,300 billion in 2010, but by early 2013 had nearly recovered to this peak. Housing prices fell approximately 30% on average from their mid-2006 peak to mid-2009 and remained at approximately that level as of March 2013. Stock market prices, as measured by the S&P 500 index, fell 57% from their October 2007 peak of 1,565 to a trough of 676 in March 2009. Stock prices began a steady climb thereafter and returned to record levels by April 2013. The net worth of U.S. households and non-profit organizations fell from a peak of approximately $67 trillion in 2007 to a trough of $52 trillion in 2009, a decline of $15 trillion or 22%. It began to recover thereafter and was $66 trillion by Q3 2012. 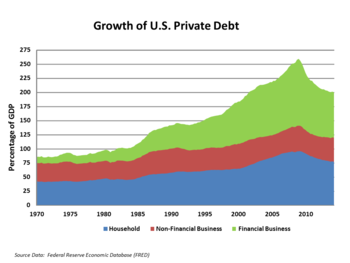 U.S. total national debt rose from 66% GDP in 2008 pre-crisis to over 103% by the end of 2012. Martin Wolf and Paul Krugman argued that the rise in private savings and decline in investment fueled a large private sector surplus, which drove sizable budget deficits. Members of US minority groups received a disproportionate number of subprime mortgages, and so have experienced a disproportionate level of the resulting foreclosures. A study commissioned by the ACLU on the long-term consequences of these discriminatory lending practices found that the housing crisis will likely widen the black-white wealth gap for the next generation. Recent research shows that complex mortgages were chosen by prime borrowers with high income levels seeking to purchase expensive houses relative to their incomes. Borrowers with complex mortgages experienced substantially higher default rates than borrowers with traditional mortgages with similar characteristics. The crisis had a devastating effect on the U.S. auto industry. New vehicle sales, which peaked at 17 million in 2005, recovered to only 12 million by 2010. The crisis in Europe generally progressed from banking system crises to sovereign debt crises, as many countries elected to bail out their banking systems using taxpayer money. Greece was different in that it concealed large public debts in addition to issues within its banking system. Several countries received bailout packages from the “troika” (European Commission, European Central Bank, International Monetary Fund), which also implemented a series of emergency measures. However, with the exception of Germany, each of these countries had public-debt-to-GDP ratios that increased (i.e., worsened) from 2010 to 2011, as indicated in the chart shown here. Greece’s public-debt-to-GDP ratio increased from 143% in 2010 to 165% in 2011. This indicates that despite improving budget deficits, GDP growth was not sufficient to support a decline (improvement) in the debt-to-GDP ratio for these countries during this period. 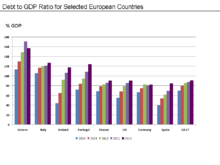 Eurostat reported that the debt to GDP ratio for the 17 Euro area countries together was 70.1% in 2008, 79.9% in 2009, 85.3% in 2010, and 87.2% in 2011. Unemployment is another variable that might be considered in evaluating austerity measures. According to the CIA World Factbook, from 2010 to 2011, the unemployment rates in Spain, Greece, Ireland, Portugal, and the UK increased. France and Italy had no significant changes, while in Germany and Iceland the unemployment rate declined. Eurostat reported that Eurozone unemployment reached record levels in September 2012 at 11.6%, up from 10.3% the prior year. Unemployment varied significantly by country. Economist Martin Wolf analyzed the relationship between cumulative GDP growth from 2008 to 2012 and total reduction in budget deficits due to austerity policies (see chart) in several European countries during April 2012. He concluded that: “In all, there is no evidence here that large fiscal contractions [budget deficit reductions] bring benefits to confidence and growth that offset the direct effects of the contractions. They bring exactly what one would expect: small contractions bring recessions and big contractions bring depressions.” Changes in budget balances (deficits or surpluses) explained approximately 53% of the change in GDP, according to the equation derived from the IMF data used in his analysis. This chart compares U.S. potential GDP under two CBO forecasts (one from 2007 and one from 2016) versus the actual real GDP. It is based on a similar diagram from economist Larry Summers from 2014. The crisis had a significant and long-lasting impact on U.S. employment. During the Great Recession, 8.5 million jobs were lost from the peak employment in early 2008 of approximately 138 million to the trough in February 2010 of 129 million, roughly 6% of the workforce. From February 2010 to September 2012, approximately 4.3 million jobs were added, offsetting roughly half the losses. In Spring 2011 there were about a million homes in foreclosure in the United States, several million more in the pipeline, and 872,000 previously foreclosed homes in the hands of banks. Sales were slow; economists estimated that it would take three years to clear the backlogged inventory. According to Mark Zandi of Moody’s Analytics, home prices were falling and could be expected to fall further during 2011. However, the rate of new borrowers falling behind in mortgage payments had begun to decrease. The New York Times reported in January 2015 that: “About 17% of all homeowners are still ‘upside down’ on their mortgages … That’s down from 21% in the third quarter of 2013, and the 2012 peak of 31%.” Foreclosures as of October 2014 were down 26% from the prior year, at 41,000 completed foreclosures. That was 65% below the peak in September 2010 (roughly 117,000), but still above the pre-crisis (2000-2006) average of 21,000 per month. During the crisis and ensuing recession, U.S. consumers increased their savings as they paid down debt (“deleveraged”) but corporations simultaneously were reducing their investment. In a healthy economy, private sector savings placed into the banking system is borrowed and invested by companies. This investment is one of the major components of GDP. A private sector financial deficit from 2004 to 2008 transitioned to a large surplus of savings over investment that exceeded $1 trillion by early 2009 and remained above $800 billion as of September 2012. Part of this investment reduction related to the housing market, a major component of investment in the GDP computation. This surplus explains how even significant government deficit spending would not increase interest rates and how Federal Reserve action to increase the money supply does not result in inflation, because the economy is awash with savings with no place to go. 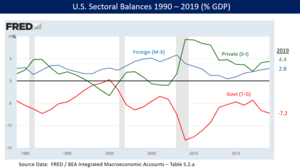 Sectoral financial balances in US economy 1990–2017. By definition, the three balances must net to zero. Since 2009, the US foreign surplus (trade deficit) and private sector surplus have driven a government budget deficit. Economist Wynne Godley explained in 2004-2005 how U.S. sector imbalances posed a significant risk to the U.S. and global economy. The combination of a high and growing foreign sector surplus and high government sector deficit meant that the private sector was moving towards a net borrowing position (from surplus to deficit) as a housing bubble developed, which he warned was an unsustainable combination. Economist Martin Wolf explained in July 2012 that government fiscal balance is one of three major financial sectoral balances in the U.S. economy, the others being the foreign financial sector and the private financial sector. The sum of the surpluses or deficits across these three sectors must be zero by definition. In the U.S., a foreign financial surplus (or capital surplus) exists because capital is imported (net) to fund the trade deficit. 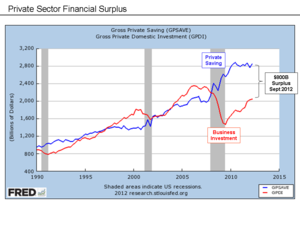 Further, there is a private sector financial surplus due to household savings exceeding business investment. By definition, there must therefore exist a government budget deficit so all three net to zero. The government sector includes federal, state and local. For example, the government budget deficit in 2011 was approximately 10% GDP (8.6% GDP of which was federal), offsetting a capital surplus of 4% GDP and a private sector surplus of 6% GDP. Various actions have been taken since the crisis became apparent in August 2007. In September 2008, major instability in world financial markets increased awareness and attention to the crisis. Various agencies and regulators, as well as political officials, began to take additional, more comprehensive steps to handle the crisis. To date, various government agencies have committed or spent trillions of dollars in loans, asset purchases, guarantees, and direct spending. For a summary of U.S. government financial commitments and investments related to the crisis, see CNN – Bailout Scorecard. Lowered the target for the Federal funds rate from 5.25% to 2%, and the discount rate from 5.75% to 2.25%. This took place in six steps occurring between 18 September 2007 and 30 April 2008; In December 2008, the Fed further lowered the federal funds rate target to a range of 0–0.25% (25 basis points). Created a variety of lending facilities to enable the Fed to lend directly to banks and non-bank institutions, against specific types of collateral of varying credit quality. These include the Term Auction Facility (TAF) and Term Asset-Backed Securities Loan Facility (TALF). In November 2008, the Fed announced a $600 billion program to purchase the MBS of the GSE, to help lower mortgage rates. In March 2009, the Federal Open Market Committee decided to increase the size of the Federal Reserve’s balance sheet further by purchasing up to an additional $750 billion of government-sponsored enterprise mortgage-backed securities, bringing its total purchases of these securities to up to $1.25 trillion this year, and to increase its purchases of agency debt this year by up to $100 billion to a total of up to $200 billion. Moreover, to help improve conditions in private credit markets, the Committee decided to purchase up to $300 billion of longer-term Treasury securities during 2009. On 13 February 2008, President George W. Bush signed into law a $168 billion economic stimulus package, mainly taking the form of income tax rebate checks mailed directly to taxpayers. Checks were mailed starting the week of 28 April 2008. However, this rebate coincided with an unexpected jump in gasoline and food prices. This coincidence led some to wonder whether the stimulus package would have the intended effect, or whether consumers would simply spend their rebates to cover higher food and fuel prices. On 17 February 2009, U.S. President Barack Obama signed the American Recovery and Reinvestment Act of 2009, an $787 billion stimulus package with a broad spectrum of spending and tax cuts. Over $75 billion of the package was specifically allocated to programs which help struggling homeowners. This program is referred to as the Homeowner Affordability and Stability Plan. The U.S. government continued to run large deficits post-crisis, with the national debt rising from $10.0 trillion as of September 2008 to $16.1 trillion by September 2012. The debt increases were $1.89 trillion in fiscal year 2009, $1.65 trillion in 2010, $1.23 trillion in 2011, and $1.26 trillion in 2012. Losses on mortgage-backed securities and other assets purchased with borrowed money have dramatically reduced the capital base of financial institutions, rendering many either insolvent or less capable of lending. Governments have provided funds to banks. Some banks have taken significant steps to acquire additional capital from private sources. The U.S. government passed the Emergency Economic Stabilization Act of 2008 (EESA or TARP) during October 2008. This law included $700 billion in funding for the “Troubled Assets Relief Program” (TARP). Following a model initiated by the United Kingdom bank rescue package, $205 billion was used in the Capital Purchase Program to lend funds to banks in exchange for dividend-paying preferred stock. Another method of recapitalizing banks is for government and private investors to provide cash in exchange for mortgage-related assets (i.e., “toxic” or “legacy” assets), improving the quality of bank capital while reducing uncertainty regarding the financial position of banks. U.S. Treasury Secretary Timothy Geithnerannounced a plan during March 2009 to purchase “legacy” or “toxic” assets from banks. The Public-Private Partnership Investment Program involves government loans and guarantees to encourage private investors to provide funds to purchase toxic assets from banks. As of April 2012, the government had recovered $300 billion of the $414 billion that was ultimately distributed to them via TARP. Some elements of TARP such as foreclosure prevention aid will not be paid back. Estimated taxpayer losses were $60 billion. For a summary of U.S. government financial commitments and investments related to the crisis, see CNN – Bailout Scorecard. 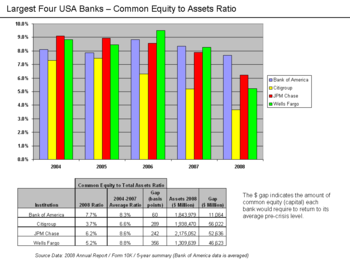 For a summary of TARP funds provided to U.S. banks as of December 2008, see Reuters-TARP Funds. 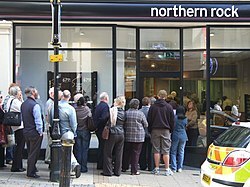 People queuing outside a Northern Rockbank branch in Birmingham, United Kingdom on September 15, 2007, to withdraw their savings because of the subprime crisis. Several major financial institutions either failed, were bailed out by governments, or merged (voluntarily or otherwise) during the crisis. While the specific circumstances varied, in general the decline in the value of mortgage-backed securities held by these companies resulted in either their insolvency, the equivalent of bank runs as investors pulled funds from them, or inability to secure new funding in the credit markets. These firms had typically borrowed and invested large sums of money relative to their cash or equity capital, meaning they were highly leveraged and vulnerable to unanticipated credit market disruptions. The five largest U.S. investment banks, with combined liabilities or debts of $4 trillion, either went bankrupt (Lehman Brothers), were taken over by other companies (Bear Stearnsand Merrill Lynch), or were bailed out by the U.S. government (Goldman Sachs and Morgan Stanley) during 2008. Government-sponsored enterprises (GSE) Fannie Mae and Freddie Mac either directly owed or guaranteed nearly $5 trillion in mortgage obligations, with a similarly weak capital base, when they were placed into receivership in September 2008. For scale, this $9 trillion in obligations concentrated in seven highly leveraged institutions can be compared to the $14 trillion size of the U.S. economy (GDP) or to the total national debt of $10 trillion in September 2008. Major depository banks around the world had also used financial innovations such as structured investment vehicles to circumvent capital ratio regulations. Notable global failures included Northern Rock, which was nationalized at an estimated cost of £87 billion ($150 billion). In the U.S., Washington Mutual (WaMu) was seized in September 2008 by the US Office of Thrift Supervision (OTS). This would be followed by the “shotgun wedding” of Wells Fargo and Wachovia after it was speculated that without the merger Wachovia was also going to fail. Dozens of U.S. banks received funds as part of the TARP or $700 billion bailout. The TARP funds gained some controversy after PNC Financial Services received TARP money, only to turn around hours later and purchase the struggling National City Corp., which itself had become a victim of the subprime crisis. As a result of the financial crisis in 2008, twenty-five U.S. banks became insolvent and were taken over by the FDIC. As of August 14, 2009, an additional 77 banks became insolvent. This seven-month tally surpasses the 50 banks that were seized in all of 1993, but is still much smaller than the number of failed banking institutions in 1992, 1991, and 1990. The United States has lost over 6 million jobs since the recession began in December 2007. The FDIC deposit insurance fund, supported by fees on insured banks, fell to $13 billion in the first quarter of 2009. That is the lowest total since September 1993. According to some, the bailouts could be traced directly to Alan Greenspan’s efforts to reflate the stock market and the economy after the tech stock bust, and specifically to a February 23, 2004 speech Mr. Greenspan made to the Mortgage Bankers Association where he suggested that the time had come to push average American borrowers into more exotic loans with variable rates, or deferred interest. This argument suggests that Mr. Greenspan sought to enlist banks to expand lending and debt to stimulate asset prices and that the Federal Reserve and US Treasury Department would back any losses that might result. As early as March 2007 some commentators predicted that a bailout of the banks would exceed $1 trillion, at a time when Ben Bernanke, Alan Greenspan and Henry Paulson all claimed that mortgage problems were “contained” to the subprime market and no bailout of the financial sector would be necessary. 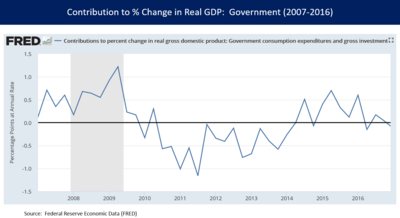 U.S. federal government spending was held relatively level around $3.5 trillion from 2009-2014, which created a headwind to recovery, reducing real GDP growth by approximately 0.5% per quarter (annualized) on average between Q3 2010 and Q2 2014. Both lenders and borrowers may benefit from avoiding foreclosure, which is a costly and lengthy process. Some lenders have offered troubled borrowers more favorable mortgage terms (e.g. refinancing, loan modification or loss mitigation). Borrowers have also been encouraged to contact their lenders to discuss alternatives. The Economist described the issue this way in February 2009: “No part of the financial crisis has received so much attention, with so little to show for it, as the tidal wave of home foreclosures sweeping over America. Government programmes have been ineffectual, and private efforts not much better.” Up to 9 million homes may enter foreclosure over the 2009–2011 period, versus one million in a typical year. At roughly U.S. $50,000 per foreclosure according to a 2006 study by the Chicago Federal Reserve Bank, 9 million foreclosures represents $450 billion in losses. 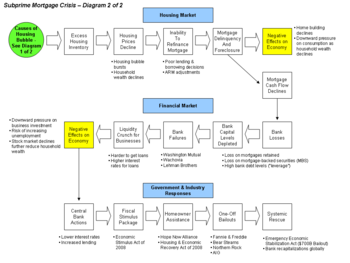 A variety of voluntary private and government-administered or supported programs were implemented during 2007–2009 to assist homeowners with case-by-case mortgage assistance, to mitigate the foreclosure crisis engulfing the U.S. One example is the Hope Now Alliance, an ongoing collaborative effort between the US Government and private industry to help certain subprime borrowers. In February 2008, the Alliance reported that during the second half of 2007, it had helped 545,000 subprime borrowers with shaky credit, or 7.7% of 7.1 million subprime loans outstanding as of September 2007. A spokesperson for the Alliance acknowledged that much more must be done. During late 2008, major banks and both Fannie Mae and Freddie Mac established moratoriums (delays) on foreclosures, to give homeowners time to work towards refinancing. Critics have argued that the case-by-case loan modification method is ineffective, with too few homeowners assisted relative to the number of foreclosures and with nearly 40% of those assisted homeowners again becoming delinquent within 8 months. In December 2008, the U.S. FDIC reported that more than half of mortgages modified during the first half of 2008 were delinquent again, in many cases because payments were not reduced or mortgage debt was not forgiven. This is further evidence that case-by-case loan modification is not effective as a policy tool. In February 2009, economists Nouriel Roubini and Mark Zandi recommended an “across the board” (systemic) reduction of mortgage principal balances by as much as 20–30%. Lowering the mortgage balance would help lower monthly payments and also address an estimated 20 million homeowners that may have a financial incentive to enter voluntary foreclosure because they are “underwater” (i.e. the mortgage balance is larger than the home value). A study by the Federal Reserve Bank of Boston indicated that banks were reluctant to modify loans. Only 3% of seriously delinquent homeowners had their mortgage payments reduced during 2008. In addition, investors who hold MBS and have a say in mortgage modifications have not been a significant impediment; the study found no difference in the rate of assistance whether the loans were controlled by the bank or by investors. Commenting on the study, economists Dean Baker and Paul Willen both advocated providing funds directly to homeowners instead of banks. The Los Angeles Times reported the results of a study that found homeowners with high credit scores at the time of entering the mortgage are 50% more likely to “strategically default” – abruptly and intentionally pull the plug and abandon the mortgage – compared with lower-scoring borrowers. Such strategic defaults were heavily concentrated in markets with the highest price declines. An estimated 588,000 strategic defaults occurred nationwide during 2008, more than double the total in 2007. They represented 18% of all serious delinquencies that extended for more than 60 days in the fourth quarter of 2008. On 18 February 2009, U.S. President Barack Obama announced a $73 billion program to help up to nine million homeowners avoid foreclosure, which was supplemented by $200 billion in additional funding for Fannie Mae and Freddie Mac to purchase and more easily refinance mortgages. The plan is funded mostly from the EESA’s $700 billion financial bailout fund. It uses cost sharing and incentives to encourage lenders to reduce homeowner’s monthly payments to 31 percent of their monthly income. Under the program, a lender would be responsible for reducing monthly payments to no more than 38 percent of a borrower’s income, with government sharing the cost to further cut the rate to 31 percent. The plan also involves forgiving a portion of the borrower’s mortgage balance. Companies that service mortgages will get incentives to modify loans and to help the homeowner stay current. President Barack Obama and key advisers introduced a series of regulatory proposals in June 2009. The proposals address consumer protection, executive pay, bank financial cushions or capital requirements, expanded regulation of the shadow banking system and derivatives, and enhanced authority for the Federal Reserve to safely wind-down systemically important institutions, among others. The Dodd–Frank Wall Street Reform and Consumer Protection Act was signed into law in July 2010 to address some of the causes of the crisis. Require stronger capital and liquidity positions for financial firms and related regulatory authority. The Dodd-Frank Act addressed these elements, but stopped short of breaking up the largest banks, which grew larger due to mergers of investment banks at the core of the crisis with depository banks (e.g., JP Morgan Chaseacquired Bear Stearns and Bank of America acquired Merrill Lynch in 2008). Assets of five largest banks as a share of total commercial banking assets rose then stabilized in the wake of the crisis. During 2013, Senators John McCain (Republican) and Elizabeth Warren (Democratic) proposed a bill to separate investment and depository banking, to insulate depository banks from higher risk activities. These were separated prior to the 1999 repeal of the Glass-Steagall Act. Significant law enforcement action and litigation resulted from the crisis. The U.S. Federal Bureau of Investigation probed the possibility of fraud by mortgage financing companies Fannie Mae and Freddie Mac, Lehman Brothers, and insurer American International Group, among others. New York Attorney General Andrew Cuomo sued Long Island based Amerimod, one of the nation’s largest loan modification corporations for fraud, and issued numerous subpoenas to other similar companies. The FBI assigned more agents to mortgage-related crimes and its caseload dramatically increased. The FBI began a probe of Countrywide Financial in March 2008 for possible fraudulent lending practices and securities fraud. U.S. banks have paid considerable fines from legal settlements due to mortgage-related activities. The Economist estimated that from 2008 through October 2013, U.S. banks had agreed to $95 billion in mortgage-related penalties. Settlement amounts included Bank of America ($47.2B), JP Morgan Chase ($22.3B), Wells Fargo ($9.8B), Citigroup ($6.2B) and Goldman-Sachs ($0.9B). Bloomberg reported that from the end of 2010 to October 2013, the six largest Wall St. banks had agreed to pay $67 billion. CNBC reported in April 2015 that banking fines and penalties totaled $150 billion between 2007 and 2014, versus $700 billion in profits over that time. Many of these fines were obtained via the efforts of President Obama’s Financial Fraud Enforcement Task Force (FFETF), which was created in November 2009 to investigate and prosecute financial crimes. The FFETF involves over 20 federal agencies, 94 U.S. Attorney’s offices, and state and local partners. One of its eight working groups, the Residential Mortgage Backed Securities (RMBS) Working Group, was created in 2012 and is involved in investigating and negotiating many of the fines and penalties described above. Several books written about the crisis were made into movies. Examples include The Big Short by Michael Lewis and Too Big to Fail by Andrew Ross Sorkin. The former tells the story from the perspective of several investors who bet against the housing market, while the latter follows key government and banking officials focusing on the critical events of September 2008, when many large financial institutions faced or experienced collapse. Estimates of impact have continued to climb. During April 2008, International Monetary Fund (IMF) estimated that global losses for financial institutions would approach $1 trillion.One year later, the IMF estimated cumulative losses of banks and other financial institutions globally would exceed $4 trillion. Francis Fukuyama has argued that the crisis represents the end of Reaganism in the financial sector, which was characterized by lighter regulation, pared-back government, and lower taxes. Significant financial sector regulatory changes are expected as a result of the crisis. Fareed Zakaria believes that the crisis may force Americans and their government to live within their means. Further, some of the best minds may be redeployed from financial engineering to more valuable business activities, or to science and technology. Economist Paul Krugman wrote in 2009: “The prosperity of a few years ago, such as it was – profits were terrific, wages not so much – depended on a huge bubble in housing, which replaced an earlier huge bubble in stocks. And since the housing bubble isn’t coming back, the spending that sustained the economy in the pre-crisis years isn’t coming back either.” Niall Ferguson stated that excluding the effect of home equity extraction, the U.S. economy grew at a 1% rate during the Bush years. Microsoft CEO Steve Ballmer has argued that this is an economic reset at a lower level, rather than a recession, meaning that no quick recovery to pre-recession levels can be expected. The U.S. Federal government’s efforts to support the global financial system have resulted in significant new financial commitments, totaling $7 trillion by November, 2008. These commitments can be characterized as investments, loans, and loan guarantees, rather than direct expenditures. In many cases, the government purchased financial assets such as commercial paper, mortgage-backed securities, or other types of asset-backed paper, to enhance liquidity in frozen markets. As the crisis has progressed, the Fed has expanded the collateral against which it is willing to lend to include higher-risk assets. 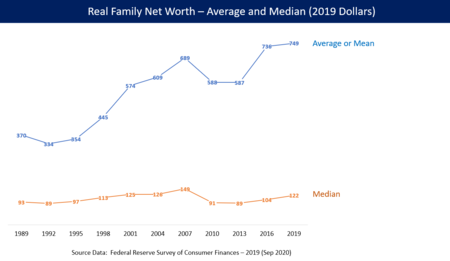 U.S. median family net worth peaked in 2007, declined due to the Great Recession until 2013, and only partially recovered by 2016. The recession officially ended in the second quarter of 2009, but the nation’s economy continued to be described as in an “economic malaise” during the second quarter of 2011. Some economists described the post-recession years as the weakest recovery since the Great Depressionand World War II. The weak economic recovery has led many to call it a “Zombie Economy”, so-called because it is neither dead nor alive. Household incomes, as of August 2012, had fallen more since the end of the recession, than during the 18-month recession, falling an additional 4.8% since the end of the recession, totally to 7.2% since the December 2007 level. Additionally as of September 2012, the long-term unemployment was the highest it had been since World War II, and the unemployment rate peaked several months after the end of the recession (10.1% in October 2009) and was above 8% until September 2012 (7.8%). The Federal Reserve kept interest rates at a historically low 0.25% from December 2008 until December 2015, when it began to raise them again. For example, U.S. federal spending rose from 19.1% GDP in fiscal year (FY) 2007 to 24.4% GDP in FY2009 (the last year budgeted by President Bush) before falling towards to 20.4% GDP in 2014, closer to the historical average. In dollar terms, federal spending was actually higher in 2009 than in 2014, despite a historical trend of a roughly 5% annual increase. This reduced real GDP growth by approximately 0.5% per quarter on average between Q3 2010 and Q2 2014. Both households and government practicing austerity at the same time was a recipe for a slow recovery. Several key economic variables (e.g., Job level, real GDP per capita, household net worth, and the federal budget deficit) hit their low point (trough) in 2009 or 2010, after which they began to turn upward, recovering to pre-recession (2007) levels between late 2012 and May 2014 (close to Reinhart’s prediction), which marked the recovery of all jobs lost during the recession. Real median household income fell to a trough of $53,331 in 2012, but recovered to an all-time high of $59,039 by 2016. However, the gains during the recovery were very unevenly distributed. Economist Emmanuel Saez wrote in June 2016 that the top 1% of families captured 52% of the total real income (GDP) growth per family from 2009-2015. The gains were more evenly distributed after the tax increases in 2013 on higher-income earners. President Obama declared the bailout measures started under the Bush Administration and continued during his Administration as completed and mostly profitable as of December 2014. As of January 2018, bailout funds had been fully recovered by the government, when interest on loans is taken into consideration. A total of $626B was invested, loaned, or granted due to various bailout measures, while $390B had been returned to the Treasury. The Treasury had earned another $323B in interest on bailout loans, resulting in an $87B profit. This entry was posted in Uncategorized and tagged adjustable-rate mortgage, Alan Greenspan, ARM, Bank of America, Bear Stearns, Ben Bernanke, CDO, central banks, credit default swap, crisis, Fannie Mae, federal reserve, financial crisis inquiry commission, Fitch ratings, Freddie Mac, Glass-Steagall, Goldman Sachs, Gramm-Leach-Bliley Act, Great Depression, Great Recession, HAMP, housing and urban development, HSBC, HUD, Lehman Brothers, MBS, Merrill Lynch, Moody's, Morgan Stanley, NA, negative amortization, ninja, no income no assets, off-balance sheet, Paul Krugman, Paul Volker, Robert Schiller, SEC, Securitization, Security and Exchange Commission, shadow banking system, special purpose vehicle, standard and poor's, subprime mortgage, The Economist, Timothy Geithner, too big to fail, Wells Fargo Bank on October 2, 2018 by dboggs07.